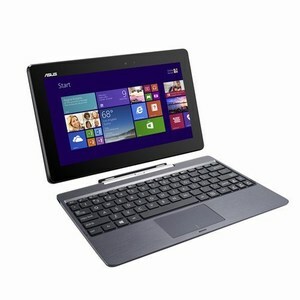 ASUS Transformer Book T100 is the beautiful ultraportable that's also an 10.1-inch Windows tablet. Detach the tablet to work and play anywhere, and dock to enjoy the comfortable keyboard, smart gesture-enabled touchpad and advanced connectivity. Style, power and convenience - Transformer Book T100 gives you it all! With a battery that lasts up to 11 hours, you're free to work or play from dawn to dusk. And ASUS Instant On technology ensures that Transformer Book T100 is always responsive and ready for action! If you think you know beautiful, behold Transformer Book T100's 10.1-inch capacitive multi-touch display. With a 16:9 ratio, 1366 x 768-pixel HD resolution and in-plane switching (IPS) technology, you'll enjoy bright, vivid images from literally any angle - that's 178 degrees of viewing clarity! Experience outstanding performance from the latest Intel Bay Trail Quad-Core processor. You'll multitask seamlessly and get more done in less time. Transformer Book T100 also delivers exceptional graphics performance - with Intel HD graphics that are faster than ever before! Transformer Book T100 is as stylish as it is durable. The iconic ASUS concentric-circle pattern catches every eye and looks amazing - and specially-engineered materials ensure it stays that way!